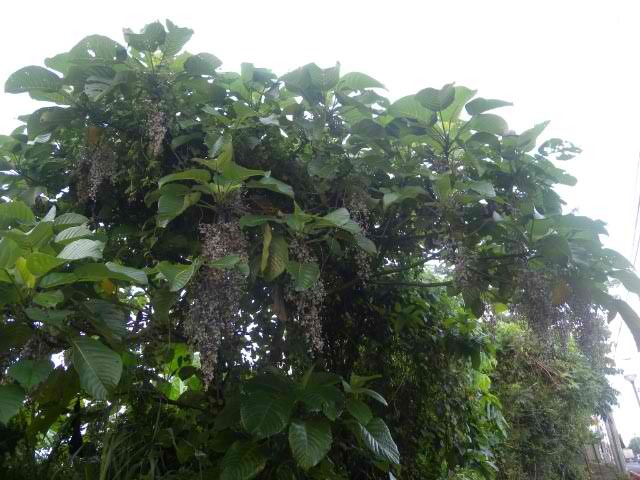 The bagawak-morado specimens (Clerodendrum quadriloculare) in the Ninoy Aquino demo plot are in bloom. This plant which I heard called by some Boholanos as Pebrero (because it flowers in February) is now in full flower regalia at the middle of December. The very large umbels of pink flowers with long tubular throats appear like exploding fireworks, thus it is also known as Mexican firecracker (though it is not from Mexico which is now very popular). It is argued to be endemic but it is very much a native of the Philippines. A very interesting native candidate as garden and landscape plant! Quickpost: I smelled the Philippine santan (Ixora philippinensis) again and this time at 10 am in the morning. It had no smell. Which means the flower is night pollinated, probably by moths. When my mom died last year, the celebrating priest on her 40th day expressed to us the importance of the number 40 in a Christian's life. He said it signifies the time for the people who were left behind by the departed to start letting go and continue living life. In easy words, he said that life must go on and the time to do it was after the 40th day. But on Leonard Co's 40th, it was not the case. The Co Family together with some concerned NGO's like PNPCSI and AGHAM commemorated Leonard's 40th day by planting more than 40 native trees to signify the continuing want for justice. 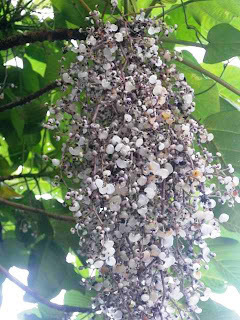 The likes of the following native trees: toog, apitong, malugay, taloto, mayapis, makaasim, bolon, tara tara, lamio, banato, iboli, marang bonouan, anang, subyang, ipil, mahunot, bolong-eta, almon, yakal, sakat, balobo, duklitan, mala-ipil, antipolo, white lauan, mangachapui, dita, batino, amugis, tindalo, talisay gubat, kalantas, kamandis, tuai, dalindingan, dungon, achuaun, kalimutain, kalimatas. Most of these trees I don't even know what they look like.But it is a welcome move to introduce these really native tree seedlings to the chosen site, the exotic tree-laden Ninoy Aquino Parks and Wildlife. This strengthens Leonard's initial intention to fill the park with native species. The Philippines have about 3500 species of trees. Bringing these 40 trees closer to the masses would help them learn more about these slowly vanishing residents of the Philippine forests. On Leonard's 40th, his family and friends signifed to continue what he started. His memory will certainly live on in these trees. Hopefully these trees will not be just a memory of the forest from which they came from. May they also live on as reminder or the richness of the Philippine's diversity, which Leonard intended to document in his lifetime. May Leonard's successors succeed in doing so. When I was in Balanga a few weeks ago I stumbled upon a gift find in the Bataan Visitor Center souvenir shop. It was a stringed bracelet of a claimed native tree seed. Immediately after I was told it was the seeds of a native tree, my suspicion went to lumbang seeds. Lumbang as we know is Aleurites moluccanna, which I have earlier discussed in this blog site, is also known as candle nut. I did not get to confirm if it was lumbang, but I figured it would make a good Christmas token for a few special lady members of the Philippine Native Plant Society. But the other day I got to confirm with Philippine Star Editor (Philippine Gardens) Ray Ong that indeed the seed in question was lumbang. But he said that the craft was actually borrowed from Hawaiians who were fond of stringing up the candle nut or kukui nuts to give as a welcome gift. Reading more in some internet logs, the kukui nut is becoming a good symbol to celebrate life. so even if the idea of the bracelet is not entirely Philippine culture, the bracelets are still a good way to express goodwill. I am glad I found them. I only got four and gave them to people who I felt would appreciate them and life the most. I wrote this small poem two years ago, revising the lyrics of a popular song 'Payapang Daigdig' by Felipe Padilla de Leon. I posted it over my old blog site as a Christmas greeting. I'll do it gain as a reminder to take care of Mother Earth. It is the only home we got. Wala nang buhay sa payapang daigdig. Ang a very merry and safe Christmas to all! I just got my third Starbucks planner for this year (I already gave away one). This third one I got by undergoing the usual way of filling up the Christmas card with 17 drink stickers. I am not much of a coffee drinker, so every chance I get to exchange coffee-based drinks with any of the other non-coffee ones, I do, just to get those little silver stickers on my little red card. The other day I downed 3 tea based drinks and this afternoon, a caramel frappuccino, just to illustrate more I am not much of a coffee fan. More than the coffee, it is the ambience in Starbucks that I like (walang pakialaman). By the way this is not a paid advertisement for Starbucks, I will be getting to a point why I started with my little interest in coffee, hehehe. Because of sitting around in the coffee place, even though I am not much of a coffee drinker, I realized that coffee is now a very popular drink in the Philippines. Maybe more reason why the cards do get filled with the stickers. Filipinos had really gone a long way from just drinking the routinary morning cup. They have now acquired the taste of globalization - designer flavored coffee. Due to this, Pinoys have also grown accustomed to calling coffee by a lot of names: Joe, java, kape, bean juice, brew, caffeine fix, mud water, etc. There are a lot more at http://www.1-800-espresso.com/coffee-nicknames.html. I took interest in the name java as it is also the name of the second largest Indonesian island where coffee is also very popular. Last August I got the chance to visit the islands of Java and Bali, and they grew their coffee beans in plantations, in higher mountainous elevations similar to Tagaytay. In fact in Bali, coffee is grown in Kintamani which is indeed very much similar to the Tagaytay rim. It also has a breath-taking view of a volcano and a lake, reminiscent of Taal. Tagaytay and the surrounding towns are known to grow excellent local coffee. Makes you wonder if coffee requires such cold mountain air to grow in optimum condition. I heard of this Starbucks story some months ago but have not confirmed it. The first Pinoy attempt to bring the Starbucks franchise to the Philippines ended in vain because the Filipino proponents suggested to mix the special Starbucks concoctions with locally grown kapeng barako, to lower down the production cost. Eventually the attempt did not push through as the international franchisor did not approve of the kapeng barako idea (not sure if the local bean failed in quality or otherwise). Now the present Starbucks franchisee (Rustan's food) was approved to push through using Davao-grown beans. So somehow when you down you next cup of caramel machiato, you know that you are drinking a little part of the Philippines down your throat. Hehehe, a little less guilt in drinking a multinational brand. But then again coffee in itself is not a Philippine native. But could you imagine the present Pinoy-life without coffee? Would the present I-pod generation go on with their daily routine without their tall, grande or venti cups of designer coffee? Probably more than half of the Filipino population would weep if they would have to give up coffee from their diets. Even the most nationalistic of botanists I know do crave for coffee. I, on the other hand, could certainly go on with my life without coffee. I would miss sitting away the hours in the coffee place though. I would probably miss the planners too. I immediately said yes to Fredd Ochavo when he asked me if I want to come explore the coasts of Balanga in Bataan. They were going birdwatching I thought and I get to tag along to see what the birds hide in or perch on. But when we arrived in Barangay Tortugas where they were holding the first Ibong Dayo Festival, I was told I would be participating in the bio blitz. I heard the term before, but have no idea what we are going to do. I was immediately introduced to Wildbird Club members Anna Gonzales and Lala Espanola. Anna is an architect in charge of bringing to realization the Balanga Citywalk, the site for the festival and future hub for birdwatching in the area. Lala is a biologist who just recently plucked a new bird species from anonymity, the Calayan rail. Both are birdwatchers extraordinaire. Fredd and I were stand-ins for the Philippine Native Plant Conservation Society. We were to conduct the bio-blitz activity and guide young participants through the photo exploration. Biology 101: Bio-blitz is a scientific activity recently formulated and used to help in biologizing an area. A group was to sweep a certain site with photo-documentation, taking pictures of all living organisms, plants, animals, etc. The pictures are then compiled and presented to experts to be identified. Thus the different living things in the would have a record and documented. In turn the participants would also learn about the particular biology of the concerned place. Tortugas is a young reclaimed area where the Balanga residents planted with mangrove species a score years ago. In 20 years the mangroves have repopulated the old fish ponds and is now teeming with new life. The participants of the Balanga bio-blitz were mostly young students. Armed with their digicams, they first swept through the mud flats, checking out the birds, molluscs and crabs bathing in the shallow water and the baking sun., then to the mangrove area, where they took snaps of the surrounding flora. Lala stood as the teacher. she explained the roles each organism took in their rightful positions in the environment. The students listened with all enthusiasm while snapping away at any chance they get. They picked up crawlers , turned over stones and chased flying insects just to take the asked pictures. In an hour's time we have only skimmed through the edges but we already had to go round up everyone and head back to Citywalk. We still had to collate the pictures and identify them. Photo-inquest was held in a nearby school where we were joined by DENR forester Jimmy Aberin, who identified the mangrove species. An hour of taking pictures with 10 students (with cameras but about 30 students participated) amounted to hundreds of pictures to see. But again limited time allowed only for 3 mangrove tree species, a coastal tree, a coastal shrub, 2 vines and a few birds to be identified. But the pictures were filed away by the Balanga government and the Wildbird Club to be handed out for identification by other scientific experts. Hopefully after a few days of emailing and posting, Balanga would eventually have its seed record of what types of organisms inhabit their reclaimed mangroves. It would certainly show more reasons why the city government have to continue its efforts in rehabilitating their shores and coastal areas. It would also aid the students in learning more about the plants and animals living in their own backyards. It is beginning to look a lot like Christmas for bird-watchers. Christmas has long been associated with winter (which is controversial for some, but that is another story) and along with the winter months comes bird migration. In the following weeks will see the influx of migrating bird populations in our archipelago. This includes the coastlines of Bataan in Luzon. Balanga City mayor Joet Garcia saw the potential for such annual phenomenon and put up the very first Ibong Dayo Festival in Balanga. The city partnered with the Wildbird Club of the Philippines and set up activities to highlight the presence of these feathered friends. they included cultural and educational programs, lectures, face painting and wall painting, bioblitz, etc. To serve as stage for the event, the Balanga government rushed the construction of its new City Walk. Newly erected structures included a pavilion, which served as an exhibit hall for the bird species present on site, and a bird watching deck, as vantage point to appreciate the flying and nesting birds better (at a safe distance for the birds). The participants, mostly children around the Balanga area, enjoyed the new complex and the activities prepared for them by the organizers. They enthusiastically joined in all the activities and lined up to learn more about this newly tapped resource in their city. To the Balanga City government and the Wildbird Club of the Philippines, congratulations for a very well-attended and inspiring event. May your efforts be emulated in other parts of the country. 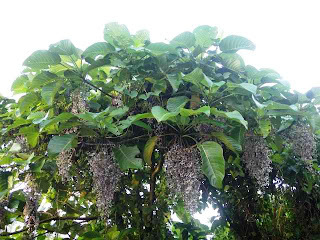 Last summer Cel Tungol and I chanced upon the flowering sole Cinnamomum mercadoi (or kalingag) tree I know growing in UP. Cinnamomum is a native genus of trees (with reported 17 species from the Philippines, including the endangered Cinnamomum cebuense). The genus is also popular because some of the members' wood bark yields excellent cinnamon flavoring. Like in any other native tree we encounter, we went around its base trying to spot falling fruits or seedlings. There were none. But we chanced upon Nana Paterna who takes care of the grounds maintenance. She was very familiar with the cinnamon tree and swears that the tree does sprout seedlings around its base. She even promised to collect the seedlings in the coming months. About the time of first semester enrollment, I tried my luck going back to Nana Paterna to ask for the cinnamon seedlings. But my luck was short then because she only collected a single specimen. But I was quite positive because after all the one seedling indicates the tree is fertile to produce viable seedlings. Last week I again tried my luck asking Nana Paterna for more and was in luck. At a small corner of the building landscape she had tucked in the groundcovers a makeshift nursery for the seedlings. She planted them in discarded noodle and softdrink cups. I was excited to see them lined up neatly beside the concrete pathwalk. I counted them all and there were more than fifty (thank you, Nana Paterna). I was already counting in my mind the people who would receive the bounty. Part of the loot was given to Cel Tungol and Prof. Ed Gomez to rear and plant in other parts of UP. Some I gave to other collectors. I took some home. But in the spirit of Christmas I am giving away a seedling to the first five people, to be picked up in UP. So, Christmas cinnamon, anyone? I will count the responses in www.pinoytrees.blogspot.com (not in facebook post, to be fair). I was sent some beautiful flowering tree pictures by Mike Asinas of Ayala Land. They are flowers of I would say the most dreaded plant in our rainforests. It is simply called lipa (probably where the city Lipa was named after). Lipa are small shrubs to trees belonging to the genus Dendrocnide, members of the nettle family Urticaceae. The one pictured is probably Dendrocnide meyeniana or lipang kalabaw. A seasoned mountaineer would probably recognize this plant even without flowers. Not doing so will be unfortunate. The leaves could inflict serious skin irritation or pain which could last quite sometime. It is a shame as the inflorescence is quite impressive. A year ago I got to see the gardens of Pundacion Pacita in Batanes. I saw specimens of this plant proudly displayed with flowers in a prominent area in their garden (background plant of the topiaries - upper right hand corner). I am not sure if the owners know that the plant has this nasty reputation or just that they were so enamoured with the pretty flowers. Or would the Abads know a secret how to keep them in the garden without getting the itch? Has the Voyavoy Finally Arrived? I am batting for the native palm, Phoenix loureiri var loureiri or voyavoy, to become the next in-thing in Philippine landscaping. The palm could very well give Cycas revoluta (oliva palm) a run for its money. The only problem I perceive is that voyavoy is not known in local landscaping and that there are no specimens commercially available. Another thing is that Batanes is a protected area so more than any part (with the exception of Palawan) of the Philippines, it is hard to bring out plants from there. But am hoping this would not be the case for long. The other weekend I again made a trip to the Tabang gardens. I have not been there for 3 years. So I got the surprise to see these pictured palms being sold at one of the shops. They very much resemble the voyavoys of Batanes. I once read in a newspaper article that a few landscape people have already ventured in growing the local date palm from seeds, but personally have not seen these seed-grown stocks anywhere in the metro. Could these mystery dwarf date palms be the ones mentioned. I could not resist buying a plant and compare the leaves to a confirmed voyavoy specimen. And if they are, I hope one day most of our landscape designers would realize that this palm is indeed a beautiful specimen to hold a place in any local garden.